More often than not, businesses demand quick thinking and even quicker reaction times when it comes to decision making. As we often hear from decision makers, time is money and prolonging solutions to present issues only cost most companies more money by the minute. 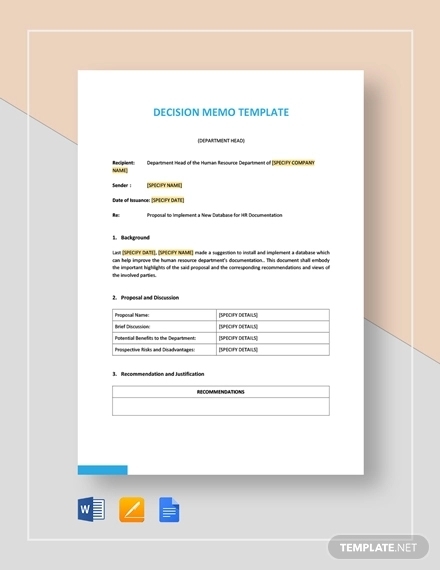 Just as a legal memorandum serves its purpose in a legal office, the decision memo does the same thing in a manufacturing, production, or corporate business setting. 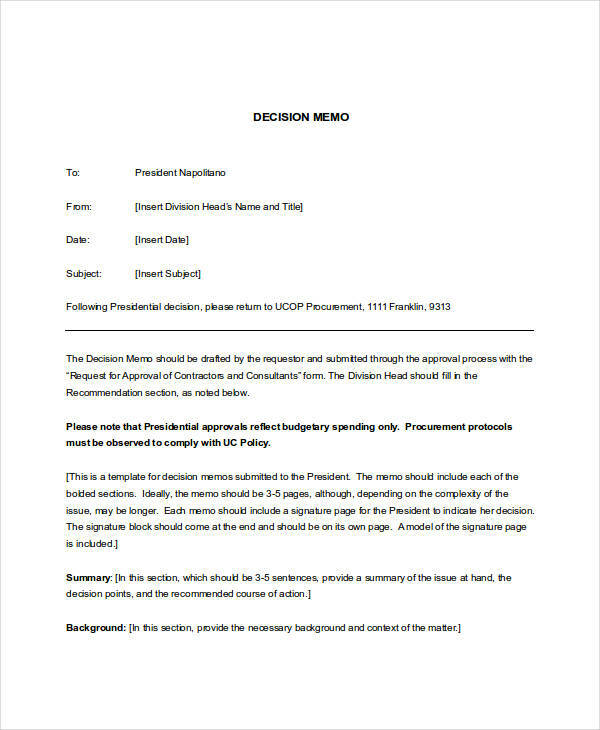 Several examples with different memo formats can also be found in the site. Feel free to go to our home page and search for a particular memo that you want. 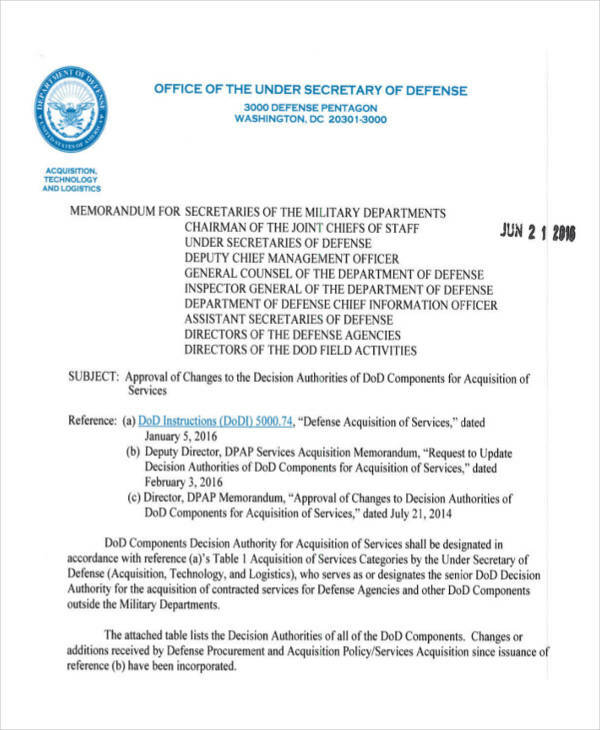 What Is a Decision Memo? 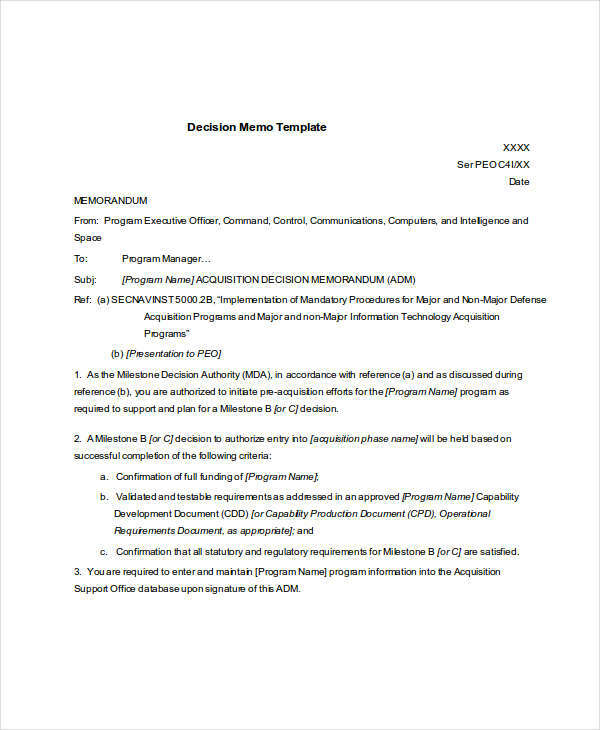 A decision memo is a short document written to offer or recommend a course of action or advice on important and critical decisions that need to be made. 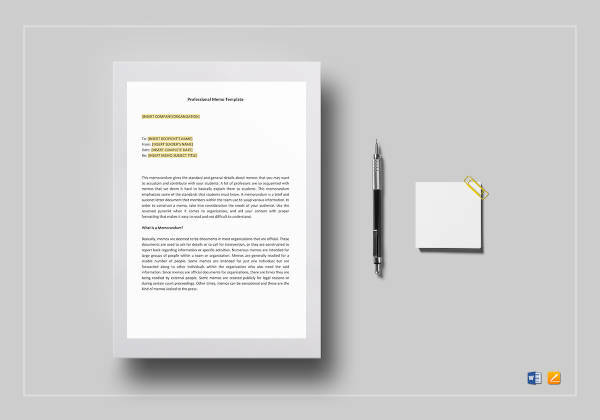 Being able to convey the entirety of the message without making the complexity apparent is key to effectively delivering or writing a decision memo. 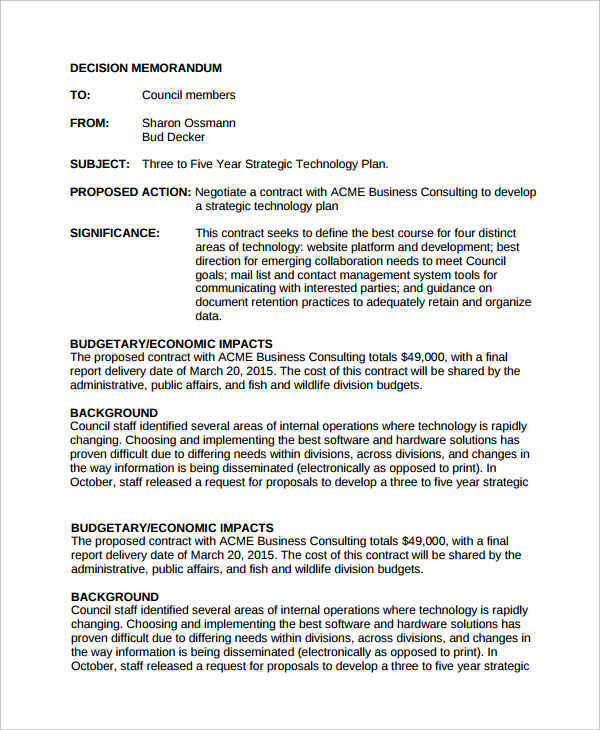 It is also a sort of internal memo or company memo since it is to be circulated only within the internal circles of management responsible for making the decision. Memo examples in Word and work memo examples seen in the page further provide information regarding the making of a memo. 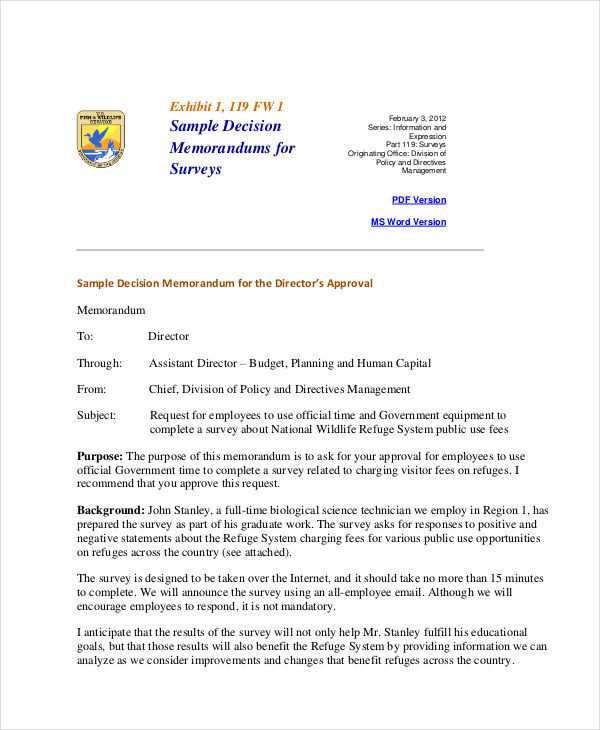 Define the purpose of your memo keeping in mind the audience or recipients of the memo. Jot down ideas regarding the topic of the memo to make sure you don’t miss out anything important. Classify ideas into a heading or different headings. Set an order or arrangement of the ideas. Edit to ensure clarity and conciseness of the message. Memo examples and management memo examples in the page are shown for additional reference in making a memo. Just click on the individual download link button to have a closer look at the sample. Always ask why the memo is being written and why a reader would be interested. Defining what the problem is first is integral before recommending any kind of solution. Create a summary of your findings and recommendations. Making a flow diagram of how you got to your solution helps in better explaining the recommendation. Present solutions along with advantages and disadvantages. Make sure to support your recommendations with supplemental data. 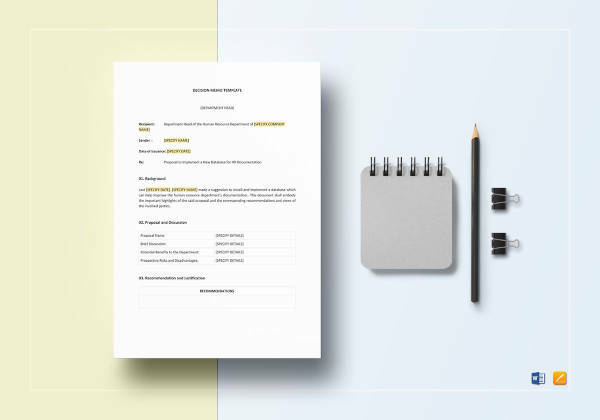 Define and describe situational qualifications, and present counterarguments or challenges that may potentially arise. Recommend the next steps or action plans to implement given solutions or recommendations. 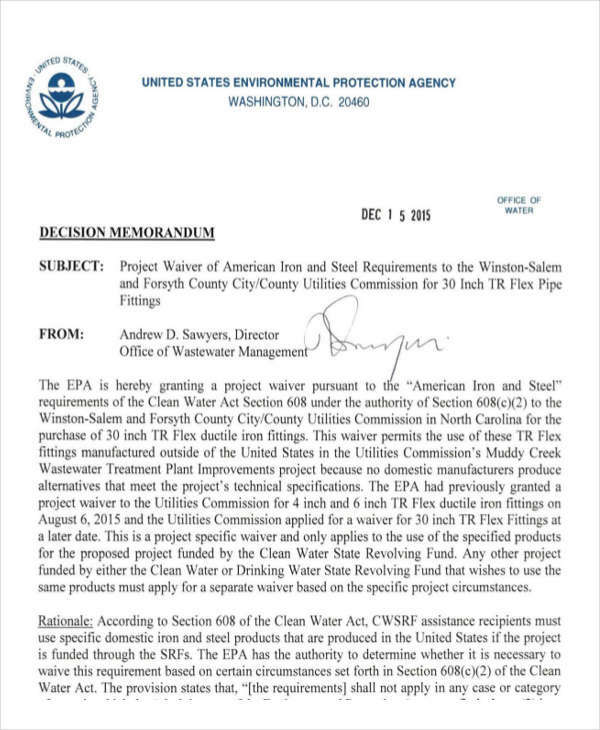 Concrete examples of such memos will prove invaluable. Feel free to browse the site for examples of any specific memos that you have in mind. All examples provided are easily and freely downloadable by clicking on the download link button below the sample.